TUCSON, AZ (KOLD News 13) - Tucson Fire crews responded to a fire at a strip mall on the 3300 block of North 1st Avenue just before 7:30 a.m. Monday. 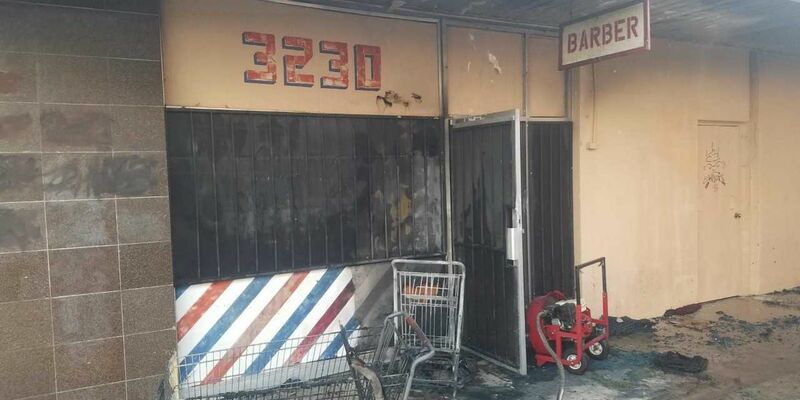 Shortly after arrival, firefighters extinguished the flames in front of a barbershop, according to a tweet from the department. Crews followed up by checking for fire extension into the interior of the small business. No extension was found and smoke was cleared from the structure using pressure fans. No one was reported hurt by the flames and the cause of the fire is currently under investigation. It’s the first response required by TFD to Amphi Plaza in the last six months, according to department records. Neighboring businesses have called local enforcement repeatedly though. Jodey Bingham at Nancy’s Boondock said they’ve needed police to clear out homeless people who harass customers, trash the parking lot and sleep on their patio. Arnold Silva, owner of La Botana, said he’s asked for more lights in the area, some security or anything that might keep trouble to a minimum. He’s even fed some of the homeless who wander into his restaurant, but nothing seems to improve the situation. The local crime bothers Charles Smith, owner of Tucson’s Map and Flag Center. However, he believes a larger issue is what’s really hurting his community. Smith’s watched businesses open and close in Amphi Plaza over the decades he’s worked across the street on First Avenue. Before he learned about Monday’s fire, Smith even considered moving into a smaller space there. Now he’s not interested. The longtime local business owner is still considered a new location. With less of a demand for non-essential items like maps and flags, Smith would rather adapt than quit on the community that’s kept his doors open all these years. As for the barber whose shop is temporarily closed, he said he’ll reopen as soon as he can remove the smoky smell for his shop. “Quitting means they win,” he said. The property owner agreed with other sentiments that the neighborhood is troubled, but she is currently working to redevelop the plaza.